Toriano Porter | Author. Journalist. Speaker. "I'm a white kid that grew up in white suburbia - mere miles from Park Ave, yet a world away. Toriano skillfully weaves many stories of triumph and tragedy in his heartfelt collection of childhood memories. The Pride of Park Avenue gave me a great appreciation for the ease of the path I was given, but more so a glimpse into the courage and fortitude it takes to stay away from the traps of the city. Park Avenue should be proud." "The Pride of Park Avenue, a complex, yet remarkable tribute to a community and the individuals that compose it." "I give The Pride of Park Avenue four stars for the plot, character development, and the author's supreme ability to keep me interested. Porter paints the grittiness of the streets and defines what the community needs to sustain itself. His wording was eloquent that I curtsied with my head as I totally related with The Pride of Park Avenue." "The images of street life that are contained in this book transported me to those streets. The Pride of Park Avenue is the first of its kind in the Urban/Street Lit society. Porter is very clear, concise and creative at pulling the reader into every scene he crafts. The book actually has a storyline and a well-presented flow that won't disappoint." "The Pride of Park Avenue is a book I wish I would have read before any other urban books came out because it would have been hard to follow." In the summer of 1985, the Winston clan – Virginia and Robert and their children Sonny and Cassius – move from the Southside of St. Louis to the city’s Northside and take up space on a street famously known as James Cool. The family’s resolve is tested immediately after Virginia befriends a neighborhood tough-guy; Robert gives in to the traps of success; and the two boys are targeted by the posse of thugs that terrorizes the street. Combining cool, reflective narrative, free-flowing prose and authentic character dialogue, The Pride of Park Avenue is a collection of emotionally charged personal essays about life, loss and pain, character-driven flash fiction passages of love and betrayal, action-helmed coming of age short stories centered on the pursuit of the American Dream, painstaking, tragedy-filled poetry and insanely written gonzo blog entries that form one of the more daring works of the last quarter century. "What I write are not sins; I write tragedies." Live Cool, my friends, Live Cool. 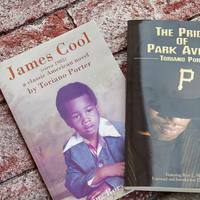 Born and raised in south St. Louis by a pair of high school dropouts, Toriano Porter discovered a love for reading and writing at an early age. Feeling left out of the loop by his more advanced-reading middle school classmates, Toriano developed a daily habit of reading whatever he could get his hands on. Now, more than 30 years later, Toriano is an author, journalist, and speaker. He has cultivated his love for the written word into a profession filled with passion to help others.